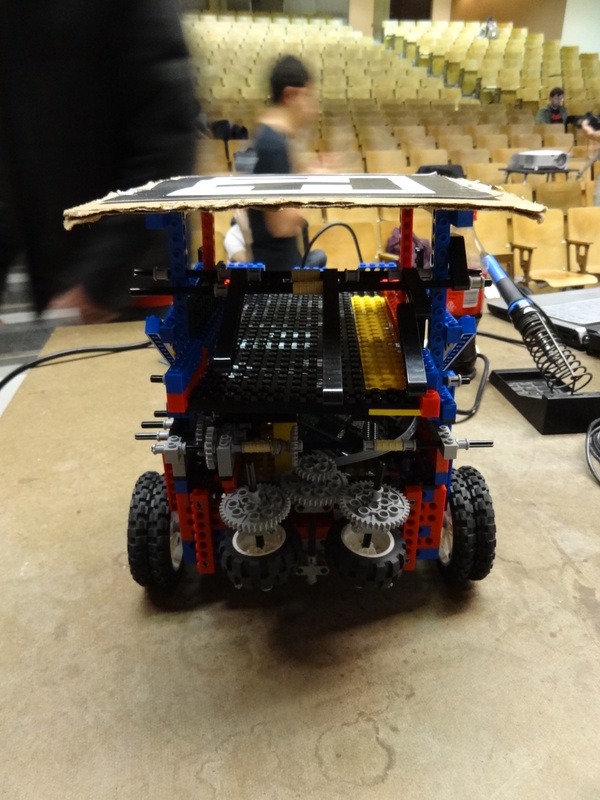 In our kit, we were provided with two motors and one servo. 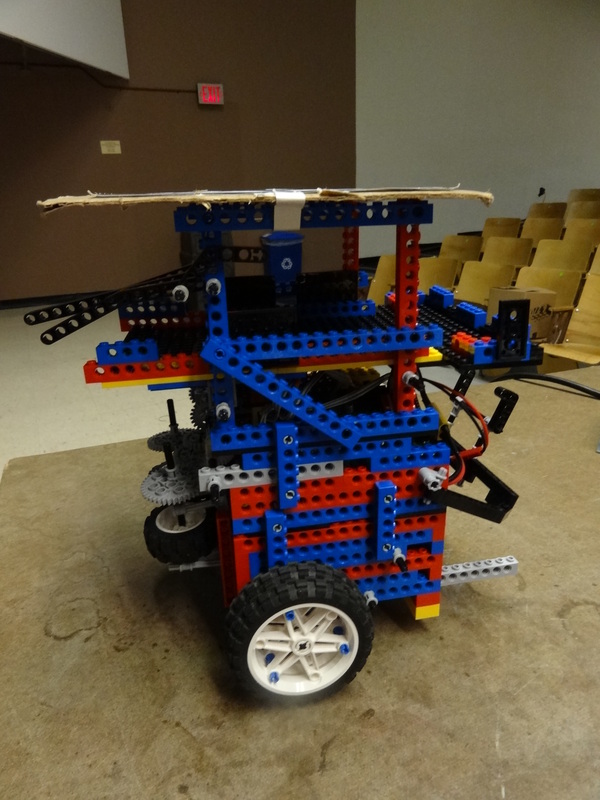 Our final version of Neville had three motors and one servo. Two of the motors were used for the wheels. Our gear ratio for the motors was 125:1. We had many difficulties with our gearbox and must have rebuilt them at least 4 times. Oftentimes, Neville would screech around the playing field. 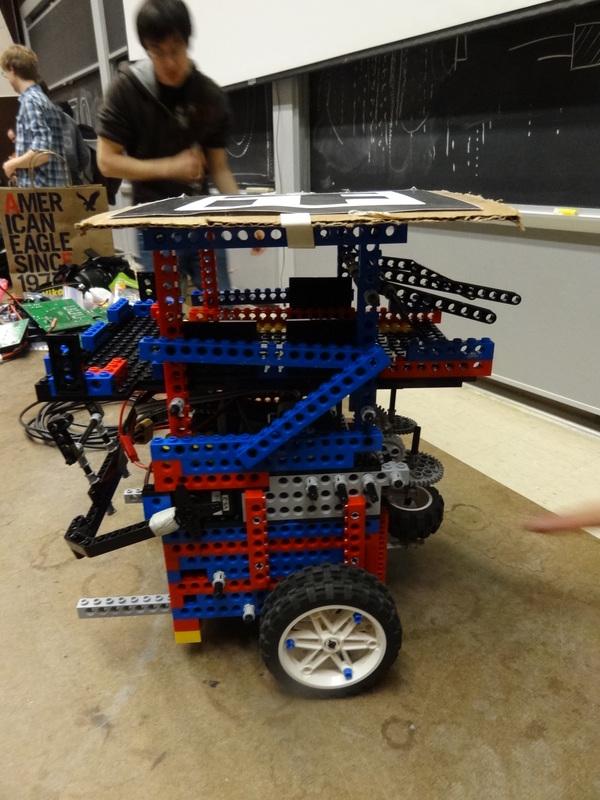 Our team was certainly jealous of the teams who had quiet robots. We did eventually discover that a few of our axles had somehow bent inside our gearbox and had to be replaced, and we found that a bushing had actually dug itself into one of the beams of the gearbox due to the force of the motor spinning. That was a problem. The wheels connected to the motor were only in the back. Our team tried a variation of different Lego pieces to create a castor wheel. Unfortunately, most of the ones we tried created too much friction and only hindered Neville’s progress around the board. Eventually, we settled for those round white Lego pieces, which were simply dragged along the floor. This allowed Neville to turn more smoothly. The third motor was used to spin the gearbox. This was bought using our sensor points. We had some difficulty creating the mechanism to spin the gearbox. One decision was whether to stand up the motor or let it lay flat. The motor is a funny size, meaning that it does not fit perfectly with the Lego pieces creating problems when standing it up. We eventually decided to let the motor spin along a horizontal axis and convert the gears to spin along a vertical axis. The servo had two purposes: to pull the lever and tip up our ball collector. Our collecting tray was hinged above the lever mechanism. 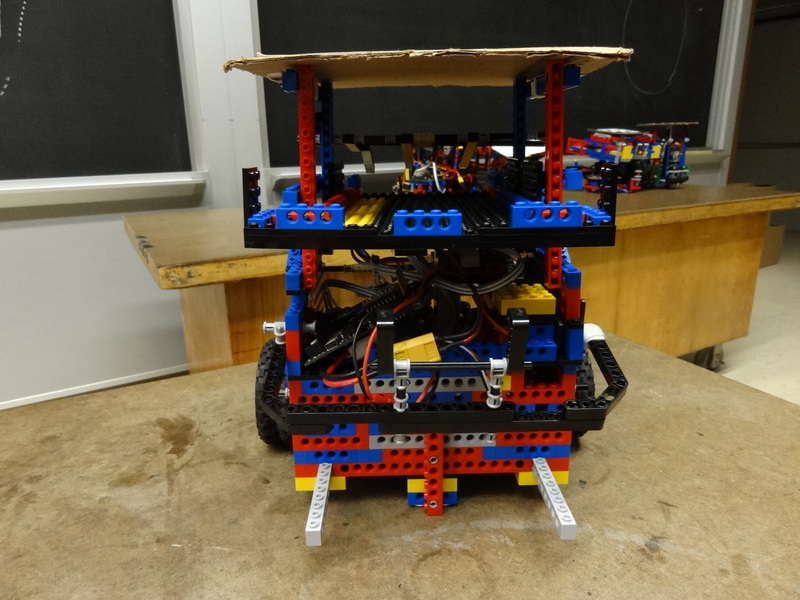 When the servo rotated forwards, the arms would pull the lever and the balls would fall into our tray. To dump the balls, the servo would move the arms backwards so that they hit the underside of the tray. This tipped the tray and allowed the balls to fall out.